엔토 매니저님! 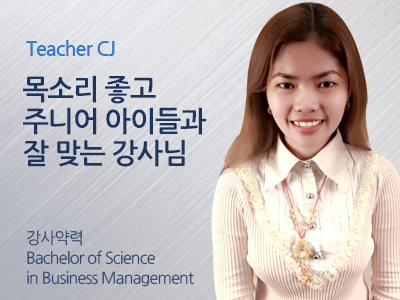 CJ 선생님은 어떤 분이신가요? 밝고 명랑한 CJ 선생님은 시간을 변경해서 서브 수업을 받은 학생들에게도 인기가 많으신 강사님입니다. 다양한 예시와 영어 표현으로 수업을 알차게 진행하고 싶은 학생분들에게 추천해드리고 싶으며 발음도 꼼꼼하게 체크해주십니다. My name is Cristel Joy but I prefer to be called CJ. 제 이름은 크리스텔입니다. CJ로 불러주면 더 좋습니다. I took up Bachelor of Science in Business Management major in Operation. 저는 경영학 학사이며 운영을 전공하였습니다. I could say that teaching Koreans is a great experience that I have had before. 한국학생들을 가르치는 일은 저에게 가장 뜻깊은 경험입니다. As a teacher, I will provide simple but efficient ways to all of my students. I encourage them to motivate and speak English confidently so they can express what they want to say as their own language. 강사로서 저는 모든 학생들에게 간단하지만 효율적인 방법으로 수업을 진행합니다. 저는 학생들이 자신들의 언어로 자신들이 말 하고자 하는 부분을 표현할 수 있도록 확신과 동기를 부여할 것입니다. I believed my strength as an English teacher comes from my “Passion and Determination”. 영어강사로서의 저의 강점은 ‘열정과 결단력’에서 나온다고 생각합니다. Passion - I can tell you that there is 100 % devoted to this work, because there is a passion for English education. Determination - To fulfill my responsibilities as a teacher, I always do my best to ensure that students can improve their English skill. 열정- 저는 영어교육에 대하여 마음 깊숙한 곳으로부터의 열정이 있기에 이 일에 대해 100% 헌신하고 있다고 말할 수 있습니다. 결단력- 강사로서의 책임을 다하기 위해 저는 학생들이 꼭 발전할 수 있도록 최선을 다하고 있습니다. So for me, the meaning of learning is not to improve the speaking, intonation, and grammar, or increase vocabulary. We need to learn English as a global language, to fill the gap between different things and to shut down the walls. 그래서 저에게 있어 배움의 의미는 단지 영어로 말하는 스킬을 발전시킨다거나 엑센트를 개선한다거나 문법을 잘 한다거나 어휘력을 늘리는 수준이 아닙니다. 서로 다른 것들의 간격을 메우고 벽을 허무는 수준으로 전세계 공용어로서의 영어를 배워야 한다는 것이지요. I believe that “good communication prevents conflict and leads to peace”. 저는 좋은 소통이 갈등을 방지하고 평화로 나아가는 데 도움이 된다고 믿는답니다. So in my class you could expect that we’re not just going to learn English but at the same time we’re going to have fun-filled moments during my class! 그래서 저의 수업시간에는 단지 영어공부만 하는 것이 아니고 동시에 즐거움이 가득한 시간을 만들어 갈 것을 기대하셔도 좋습니다.